Managed print might sound complicated when you first hear it, but that couldn’t be further from the reality. 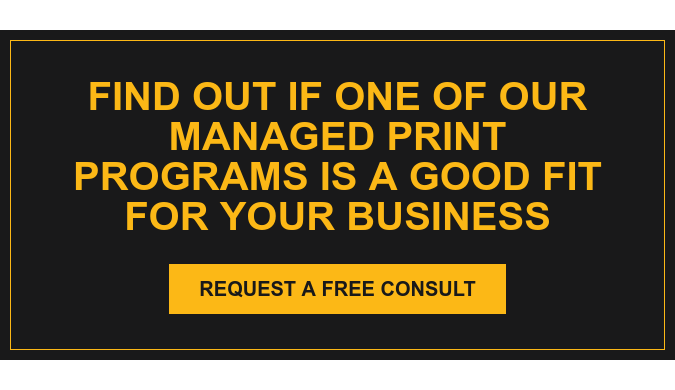 With Marco’s Managed Print Services, the only task businesses have to do with their printers is use them. Then, when any print-related issues occur, alert us via email. That’s it. And while you print, scan, fax and copy documents, Marco handles the rest. Now, there’s no doubt about it, today’s print environments are complex. There’s a lot that goes into supplying, maintaining, updating, repairing, replacing, monitoring and upgrading business printers and copiers, but the great part about working with Marco for managed print is that we take on all that complexity. As one of the top three managed print providers in the United States, we have the service down to a science. With over 700 technicians and engineers on staff, we have the capabilities, resources and expertise to deliver managed print to businesses of any shape and size, within any area of industry. Businesses choosing to self-maintain their print environments might be getting by, but they’re probably missing out. With our print management services, you don't have to worry about issues with your print technology interrupting workflow. Regardless of the size of your print fleet, issues like running out of toner completely disappear. Better yet, your office printers can be wired up to talk to each other from across the room, and from across the country. Whenever you need everyday printing support, we’re there for you. And as we manage your print environment, your devices talk to us too. Imagine if your copy machine notified us when there is a problem instead of malfunctioning or failing to print when you’re trying to prep for a meeting? With our print management software, a malfunctioning copy machine will let us know it’s having a problem, and if we can’t solve it remotely, we’ll dispatch a technician to fix the issue. Rest assured, service isn’t the only thing you can count on when it comes to Marco’s Managed Print Services. We monitor your print environment for usage and performance, and we also always work to identify areas to improve your experience. In fact, one of the biggest benefits customers receive has to do with analytics. We capture how (and how often) each device is being used, and we catalog how much each device costs you in maintenance, repairs and supplies. The data we collect isn’t the same from business to business, either. It varies based on the specific goals of your organization, the realities of your printing practices and any other beneficial variables we can identify. If you want to look at information location by location, department by department or even employee by employee, we can make that happen. All of this information helps business owners make smart, data-driven decisions when it comes to their business printing. When most businesses hear the words “managed print,” they might assume the biggest benefit is the 24/7 technical support. And while there’s no doubt our technical support services are a valuable component of the solution, that’s just the tip of the benefits iceberg. After all, every business is unique, not only within their industry but in their approach to printing. And our capability to deliver managed print services is as unique and specialized as the customers we serve. Sure, you’ll always have access to an experienced team to troubleshoot printer issues and take care of any maintenance and repairs, but there is so much more to Marco’s Managed Print Services (MPS). In fact, some of the biggest benefits have to do with how comprehensive the service is, the ease it adds to business printing and how much money we can help you save on printing costs. That’s right, we didn’t forget your bottom line. Most customers save an average of 30 percent with managed print! The first step in a managed print services partnership is the print audit. This is when we (your print provider) take an in-depth look at your company’s print environment. This includes taking a full inventory of your print equipment - including each device’s location, make, model, age and network capability – and assessing how your employees are using them. Investing in printing equipment and print software programs can help businesses increase productivity, achieve goals and implement cost-saving initiatives. And in the current market, there is an ever-expanding portfolio of print management software applications available. With so many options, there is probably a software program out there that meets your needs. For businesses looking at working with a print management partner, pay attention to which pricing model they offer. Here at Marco, we price our managed print services based on print volume. Typically, businesses have a pretty consistent print volume, with the exception of seasonal spikes. As an added benefit to this pricing model, most businesses chose reducing print volume as one of their goals, an efficiency that can lower your overall investment. Partnering with a managed print provider brings plenty of benefits, including a positive impact on a business’ bottom line. In our experience, customers save an average of 1-3% of their total annual revenue with our managed print program. As profit margins continue to tighten, that number gets more and more appealing. If you’re curious about managed print services and interested in learning more, we have a comprehensive selection of tools and resources that can help you determine if Marco’s Managed Print Services would be a good fit for you and your business. We’ve included all types of helpful content, from blogs and videos to checklists and eBooks. For those of you with questions about print outsourcing and its impact on businesses, take a moment to review our managed print FAQ. You just might find answers to your questions.